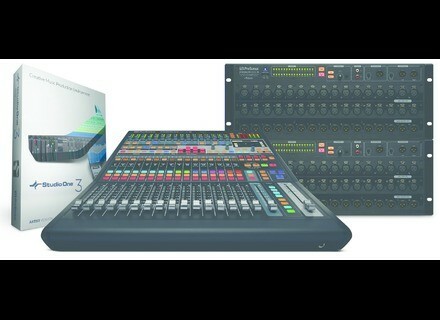 StudioLive AVB 64AI Mix System, DAW Pack from PreSonus in the StudioLive AI series. PreSonus presents its new StudioLive AVB Mix Systems, which combine rack mixer(s), control surface and integrated software. PreSonus has unveiled its new StudioLive AVB Mix Systems, a series of packs which combine one or two StudioLive RM-series rack mixers, a StudioLive CS18AI Ethernet/AVB control surface (which features eighteen 100mm touch-sensitive motorized faders), and an integrated control, recording, and production software. Scalable, fully recallable, networked over AVB Ethernet, and tightly integrated with included software, the StudioLive AVB Mix Systems put your I/O in an onstage, rack-mount mixing system with an integrated recording interface, Wi-Fi, and Ethernet networking, while providing an advanced control surface at front-of-house with 18 touchsensitive, motorized faders and 4x2 I/O. Of course, it is also possible to start with a single-mixer AVB Mix System and expand it later by cascading a second, separately purchased RM-series mixer. Both mixers in a cascaded AVB Mix System can be controlled from the StudioLive CS18AI and from UC Surface touch-control software. Price and availability to be announced later. [NAMM] PreSonus Studio 192 Mobile PreSonus introduces the Studio 192 Mobile, a USB 3.0 audio with a small form factor suitable for both mobile and studio use. Flash sale on Bell Empire Basic Loops de la Creme is having a flash sale on the Basic version of its Bell Empire Kontakt instrument. [NAMM] ROLI reveals Seaboard Rise 49 ROLI introduces the Seaboard RISE 49, a four­-octave model of its Seaboard Rise controller.